When you hire a photo booth for your event, you want the best possible quality and the best possible experience; and for that, there's simply no other choice than Snapshot Selfies. 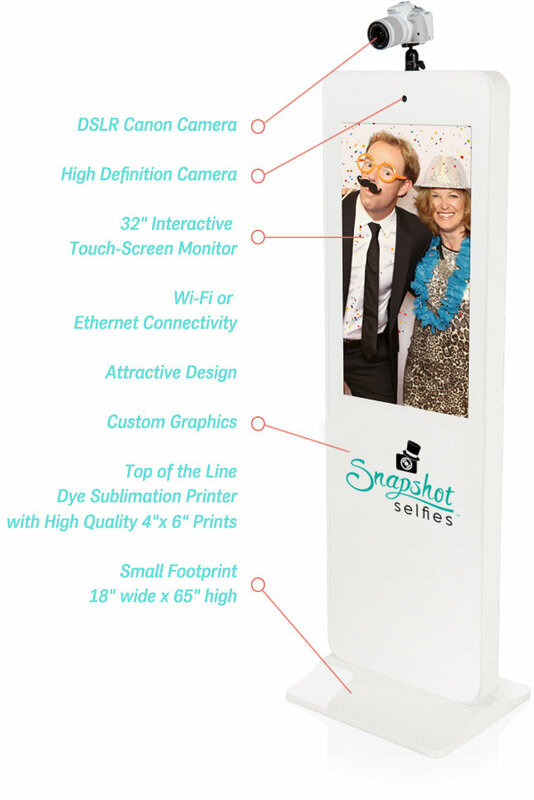 Most photo booths cram your guests into a tiny space with enough room for only 2-3 people. Our open air concept allows for bigger crowds, better lighting, and more space for fun. The DSLR camera along with the premium umbrella flash captures high quality photos like you see in photography studios. Share your pics online via Facebook, Twitter, or Pinterest or you can print and take home a keepsake from our high quality dye-sublimation printer. When your guests can edit and personalize photos, with easy to use filters and backgrounds, the post production is as much fun as posing. Watch inhibitions fade away with Snapshot Selfies! Guests can send themselves their photos right from photo booth. A high quality printer allows guests to take home a classic 2×6 photo strip or 4×6 snapshot in a flash. You can add your logo or special message on the photo booth itself and on all your photos. Mustaches and lips are a must, but we pride ourselves on providing unique and unexpected props.